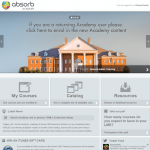 HR & LMS technology research company, Software Advice has included Absorb LMS in its list of learning management systems with the best user interfaces. You can read the full article here. chose to include Absorb LMS among the top LMS user interfaces for a simple reason: the interface itself is simple. Whereas many solutions can overwhelm users with options, Absorb LMS has streamlined its menus and course listings so that anyone—even less tech-savvy users—can easily navigate the system. If you haven’t seen Absorb LMS’s user interface, check out our YouTube channel. Or, better yet, try out the learner side of the system or contact us to schedule a full demonstration of the system.